Santa Claus Fairy Light in Hand Painted Crystal Satin, Bargain Shack offers Boyd Glass, Mosser Glass, L.G. Wright, and Contemporary Collectible Glass including Vaseline Glass - J.B. Scottie Dogs, Pooche, Animal Covered Nests, Toothpick Holders, Salts, Glass Animal Figurines, Clowns, Dolls, Slippers, Vehicles, and More! Here comes Santa Claus! 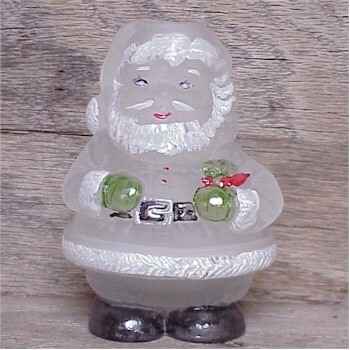 This Santa fairy light in Hand Painted Crystal Satin is sure to bring a cheery smile to your face. With a round belly and a smile on his face Santa stand 5" tall. Add your favorite scented candle and let Santa add warmth and beauty to your home for the Christmas season and all year round.